Building new relationships with your readers through email marketing and with the use of social media platforms is effective. Asking for comments by mentioning few of your techniques is a great idea. People share their methods which will help you grow. Hosting live events, that’s what I am thinking about. Great points. I like #4. This works really well. Give them ALMOST everything. They are sure to check out that recipe link, because wow that food looks amazing in the video! Definitely something I need to implement more in my business! I’m a fan of point #3 – pulling in audiences from different platforms. This supports multiple connection points, which strengthens your relationship with your audience. Looking forward to learning more about this from Jerod’s article next week! Tutorials have always felt like a win-win, I’d just never really thought of them as a call to action before. So appreciate the reframe and will definitely include more. People don’t always know how to make the most of what you offer, so that could prevent them from purchasing something from you. Including a little recipe could potentially have a big impact on that brand’s sales. What a great and actionable post. You’ve really hit the nail on the head. If I could expand on #2? Social Media is a great place to find new relationships, but you’ll never cultivate relationships if you just post an interesting headline, article, or image. It’s just not enough these days. The first thing you need to do is something I teach my clients: Create “scroll stopping” social media posts. You do this through visuals- post something that will grab the attention of the mindless scroller. I firmly believe the relationship truly develops once you’ve landed in their inbox. People are busy creatures these days and we once threw our e-mail address around like it was nothing. In today’s current age, people closely guard their e-mail. If they love you so much they’re willing to give it to you on your website, the relationship is going to rapidly grow. And a bonus tip? When you share to social media and people are commenting, reply to them! There’s nothing worse than commenting on something and the owner of the post never responds to you. It gives the impression that you’re either too busy to make time for them or you don’t care. Thanks for the extra tips, Josh! Great point about developing relationships through email … in an upcoming post, Brian is going to talk more about smart ways to use content to grow your email subscriptions. That sounds great! I’m looking forward to it. I’m totaly with you. I use that strategy on my blog! Hi Stephanie, your tip “…encourage your visitors to share the PDF rather than just share your website link” gave me an idea to make the download available without asking for an email address in return. That way you get the word out there without the “transaction” factor and hopefully attract more people to your site. That would make your freebie more of a traffic builder, not necessarily a list builder. Thanks for that inspiration! List-builder incentives are important for people who are ready to make a bigger commitment to your content, but your idea is great for simply communicating the benefits of what you offer to first-time visitors or anyone curious about your site. Your suggestion in #6 — to build your list while you host live events — sparked an idea for me: offer a How to Write Your Memoir workshop through community education. Some of them may later decide to hire a ghostwriter, and there I’ll be, already connecting with them through email. 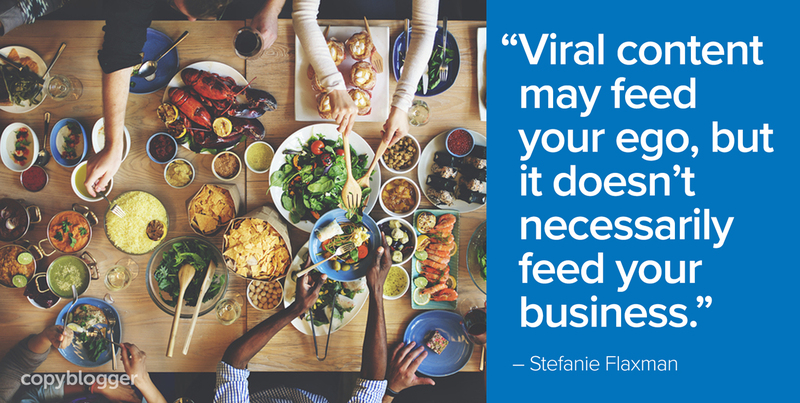 Yes, I think going “viral” is the goal for several posts, but like most other marketers, I hate the term. It’s subjective. What’s viral to one person might not be viral to another. I think what gets people to share content are an emotion connection or humorous, relatable posts (especially on social media). I also don’t necessarily think that viral content translates to conversions. It’s meant more for brand awareness. That’s the trouble I face with several clients. They want every post to result in a sale. Thanks for sharing your experience, Tawny! Great points. Hopefully you’ll be able to educate your clients to see content marketing as a continual practice … different pieces of content have different goals, and a combination of your efforts over time lead to the conversions that everyone ultimately wants.